Did you know that you don’t have to be a member of Facebook to view “Public” pages? Marvin Gardens has a Public Facebook page where viewers can simply click on the famous blue icon and go directly to the page. Here, you will find current photographs of new arrivals, interesting plantings, inspirational plant and architectural combinations as well as installations at client homes, art structures and containers used in home and garden settings and much, much more. Marvin Gardens posts mobile picture updates to Facebook on a frequent basis (many of these photos never make it to the website) – check it out soon to see what is up to the moment! Are you familiar with succulents and how they can enhance your home garden? Succulents have the unique ability to retain lots of water, which makes them great for dry soil or arid climates. Succulents come in many varieties too. 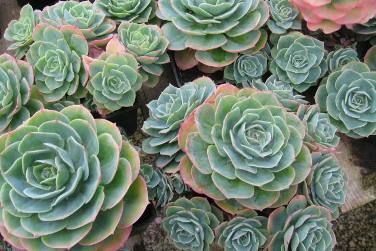 In fact, Marvin Gardens recently featured a popular succulent called Echeveria at the world-renown Philadelphia International Flower Show. Also featured were sedum, also known as “stonecrop”. Low-growing sedum is the perfect type of foliage to add to something like a rock garden at your home, whereas the higher-growing variety of sedum makes a great addition to a perennial border. Sedum is pretty easy to care for, attracts a lot of butterflies, and like other succulents, tolerates dry soil. Succulents should usually be planted in the spring and depending on the variety should be spaced from 6 to 24 inches apart. It’s really a great garden foliage to have here in southern Connecticut with our many damp spring days complimented by dry spells in the summer. For more info on how to use succulents to accent your home, give Marvin Gardens a call! Posted on April 7, 2011 Tags arid climates, butterflies, dry soil, echeveria, garden design, Philadelph, rock gardens, sedum, southern Connecticut, stonecrop, succulents.